The new ECOSYS entry-level model offers more than you could ask for: Despite its compact design, this economical colour device includes plenty of valuable functions and achieves professional results with a resolution of 1,200 dpi. 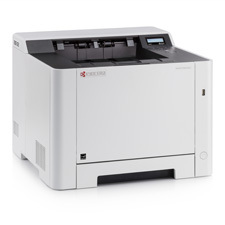 Features such as the duplex unit for double-sided printing or the direct printing functions (via Wi-Fi and USB host) keep your work running seamlessly. This reliable device is the perfect solution for small offices that set high standards. Safety standards GS, TUV, CE - This unit is manufactured according to ISO 9001 quality standard and ISO 14001 environmental standard. TK-5234K Average continuous black toner yield 2,600 pages in accordance with ISO /IEC 19798. Capacity of starter toner: Average continuous black toner yield 1,200 pages in accordance with ISO /IEC 19798. TK-5234C Average continuous cyan toner yield 2,200 pages in accordance with ISO /IEC 19798. Capacity of starter toner: Average continuous cyan toner yield 1,200 pages in accordance with ISO /IEC 19798. TK-5234M Average continuous magenta toner yield 2,200 pages in accordance with ISO /IEC 19798. Capacity of starter toner: Average continuous magenta toner yield 1,200 pages in accordance with ISO /IEC 19798. TK-5234Y Average continuous yellow toner yield 2,200 pages in accordance with ISO /IEC 19798. Capacity of starter toner: Average continuous yellow toner yield 1,200 pages in accordance with ISO /IEC 19798.